Up early and walked Mix before breakfast; even although it was Monday morning the road was extremely quiet. It is so cold that I can almost smell snow in the air. 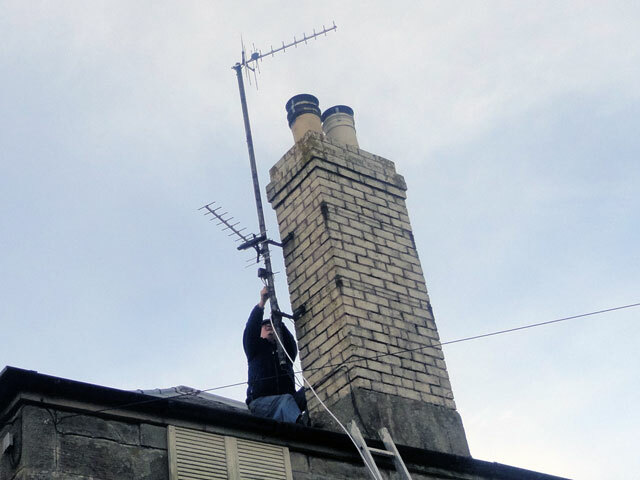 The first task of the day was to fit Mum’s television to the aerial on the roof. Tom was up the ladder like a sprightly gazelle -- although he came down more like a frozen man of the north. But the television was working and that was the object of the exercise. While we were getting ready to climb on the roof, Digger suddenly remembered that he should have taken his car in for a service, so Tom and I followed him to the garage and then went with him to the Co-op for some shopping. 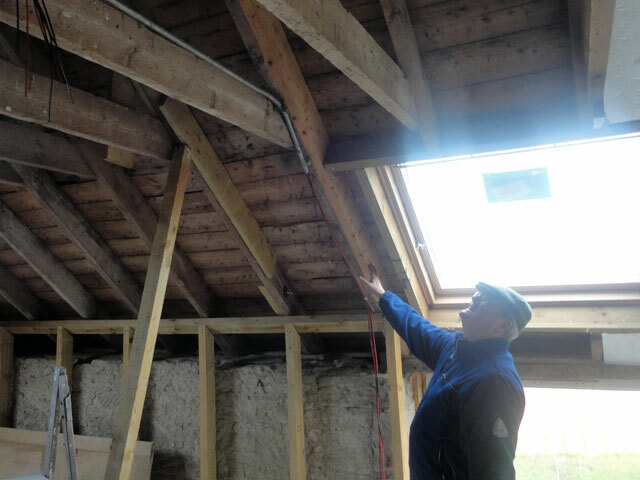 Next Tom and I went into the first floor of the Hen house to see what had to be done to get the project underway. First was a beam that will have to be replaced. 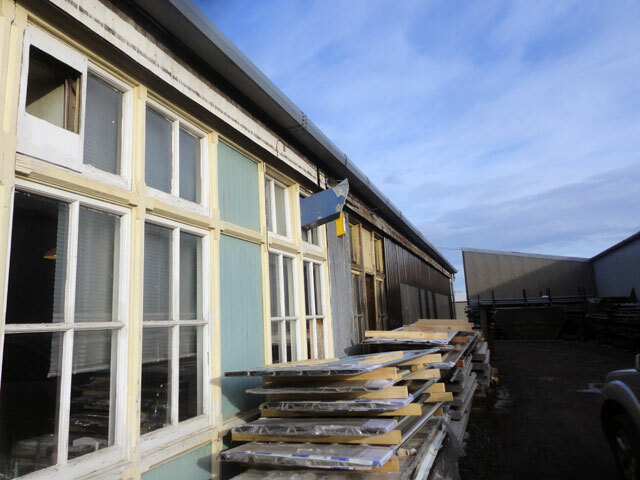 We measured it up and then went into Duns to order a new beam from Pearsons (who will deliver it for us tomorrow). Then we crossed to Thorburn and Sons to buy huge bolts to bolt-through the beam. 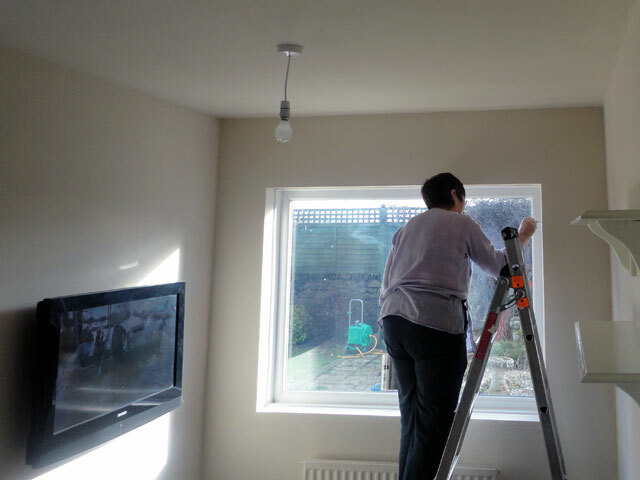 Finally we went looking, without success, for a curved curtain rail. We’ll get one at IKEA if all else fails. Back at Mount Pleasant we tacked up all of the television cable and then enjoyed coffee. Next Rachel, Mum and I went off to Tweedmouth where we chose and bought a carpet for the Garden Room. We brought it home with us and we’ll fit it tomorrow morning. Again we searched for a curved curtain rail without success – also looked for some reading spectacles, again without success. When we arrived back at Mount Pleasant it was time for supper: mince and tatties followed by tart, custard and ice cream. Yummy! I worked for a short time in the summer house and then Mix and I set off for Berwick to collect Olive. Digger’s car has not as yet been released. Digger hopes to get it back tomorrow but until then I am the main form of family transport – which suits me fine. So it has been a bitty day but we have achieved a lot – the hen house is underway, the Garden room is almost done and it is still only Monday. Did catch a bit of the Olympics -- it was mostly curling today and although the men beat Russia, both men and women lost to Sweden. Still at least in curling one gets a second chance. It was even colder when I walked Mix this evening -- we were both glad to get to bed.